This page explains how to travel by ferry from Russia, China or Japan to or from South Korea, then how to travel around Korea by train. Ferry travel from Russia to South Korea - Vladivostok to Donghae. Ferry travel from China to South Korea - Beijing to Seoul via Tianjin/Qingdao. Ferry travel from Japan to South Korea - 'Beetle' ferry from Hakata to Seoul. Train travel within South Korea - including Seoul-Busan KTX high-speed trains. Train travel to North Korea: Trains from Beijing & Moscow to Pyongyang. 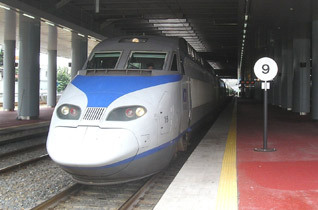 Korean Railways: www.korail.com or www.letskorail.com, including the high-speed KTX train Seoul-Busan. UK, EU, US, Australian & NZ citizens do not need a visa to visit South Korea for up to 90 days, but an onward or return ticket must be held. It's perfectly feasible to travel from the UK to South Korea overland using the Trans-Siberian Railway via either Moscow, Vladivostok and a ferry from Vladivostok to Donghae in Korea, or via Moscow, Beijing, then a ferry from Tianjin in China to Incheon in Korea. The journey will take about 14 days. See the Trans-Siberian page for details of the London - Vladivostok & London - Beijing journeys, then see the Vladivostok-Korea or China-Korea sections below. You can also travel from Japan to Korea, using a ferry from Hakata to Busan. A weekly ferry links Vladivostok with Donghae in South Korea, run by DBS Ferry, www.dbsferry.com. The ship is the 1993-built 'Eastern Dream', equipped to a good standard. The service is relatively new, starting in 2009. From March to November, the ferry sails from Vladivostok on Wednesdays at 14:00, arriving Donghae at 10:00 on Thursdays. From December to February, the ferry sails from Vladivostok on Tuesdays at 17:00, arriving Donghae at 14:00 on Wednesdays. From March to November, the ferry sails from Donghae at 14:00 on Sundays, arriving Vladivostok at 13:00 on Mondays. From December to February, the ferry sails from Donghae at 14:00 on Sundays, arriving Vladivostok at 15:00 on Mondays. Fares start at €150 one-way in economy class with a berth in a shared sleeping room, rising to €310 for a deluxe cabin. See the official site, www.dbsferry.com/02_ticket/ticket03.asp for details & booking, or you can now book at reliable UK ferry booking website www.aferry.co.uk/dbs-cruise-ferry-uk.htm. Alternatively, you can call DBS Ferry in Seoul on 00 82 2 5485502. Ask for an English speaker, reserve your place by phone, and collect and pay for the tickets at the ferry terminal in Vladivostok. For information on train travel from London & Moscow to Vladivostok, see the Trans-Siberian page. Donghae has both rail and bus links with the rest of South Korea. Trains link Donghae with Seoul (Seoul Cheongnyangi station, not Seoul main Station) 6 times a day, journey time around 5 hours 55 minutes, see www.korail.go.kr (Tip for finding train times: Use 'Cheongnyangi' as your origin/destination, not 'Seoul'). There are several ferry services from China to South Korea, including one from Tianjin to Incheon twice a week, and one from Qingdao. There are now a range of fast daytime D-category trains from Beijing South station to Qingdao taking just over 5 hours. To get the ship the same day, allowing for check-in time, take the train which leaves Beijing South at 07:10 arriving Qingdao at 12:22. You can check times at www.china-diy-travel.com. The ship sails from Qingdao at 16:00 on Mondays, Wednesdays & Fridays, arriving Incheon at 10:00 next day. 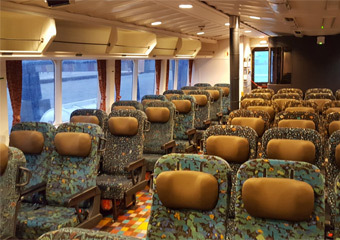 The one-way fare for the most basic berth is about 110,000 won or 750 RMB. The operator is Weidong Ferry - see www.weidong.com for sailing dates and fares and check-in times. Traveller Wendy Bishop reports: "It seems to be impossible to buy the Qingdao-Incheon Weidong ferry tickets in Beijing, but it feels a bit risky turning up in Qingdao and hoping to be able to get tickets there. However, we didn't have any problems buying tickets 4 hours before departure though (late August) - the ferry company sells the tickets from its office 100m or so from the terminal." Trains link Incheon and Seoul frequently, 39km, journey time 58 minutes. Trains link Seoul & Incheon frequently, 39km, journey time 58 minutes. The ship sails from Incheon's 2nd International Ferry Terminal at 18:00 on Tuesdays, Thursdays & Saturdays arriving Qingdao at 09:00 next day. The one-way fare for a bed in a 4-berth business class cabin is about 88,000 won or 750 RMB. The one-way fare with carpet space in a shared area is 76,000 won. The operator is Weidong Ferry, www.weidong.com for sailing dates and fares. There are a whole range of fast daytime D- and G-category high-speed trains taking just 5½ hours to Beijing South station. You should be able to make the train leaving Qingdao at 13:45 arriving Beijing South at 18:05. You can check times at www.china-diy-travel.com. Air-conditioned high-speed trains link Beijing and Tianjin frequently, taking just 30 minutes, see details here. However, the port is actually at Tanggu, some 50 km east of Tianjin itself, so it's better to take a direct train from Beijing South to Tanggu, journey time 55 minutes, with trains every hour or two. Beijing to Tanggu costs 92 RMB soft seat, 78 RMB hard seat. You can check train times at www.china-diy-travel.com. Bus 102 runs from Tanggu station to the ferry terminal, journey time 50 minutes. Ferries run by Jinchon Ferry sail from Tanggu International Ferry Terminal (50 km east of Tianjin) to Incheon twice a week, taking 25 hours. Departure from Tanggu is at 11:00 on Thursdays & Sundays, arriving Incheon at 14:00 next day. 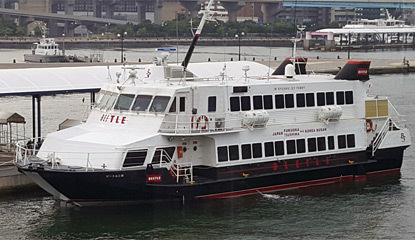 In the other direction, the ferry sails from Incheon at 13:00 on Tuesdays arriving Tanggu 14:00 Wednesdays and at 19:00 on Fridays arriving Tanggu 20:00 Saturdays. For sailing dates and times, try byferryfrom2japan.com/en/korea-china or asiaenglish.visitkorea.or.kr/ena/GK/GK EN 2 3.jsp. The ferry operator's own site (www.jinchon.co.kr) is only in Korean. The ferry fare in economy class is 888 RMB + 60 RMB tax. You should arrive at the ferry terminal 2-3 hours before sailing time. Trains link Incheon and Seoul frequently, 39 km, journey time 58 minutes. Japan Kyushu Railway Beetle service from Fukuoka (Hakata) to Busan, www.jrbeetle.co.jp. The Beetle is a fast jetfoil, taking just 2 hours 55 minutes and running 4-5 times a day. The fare is about 13,000 Yen (£100) one way, from 24,000 Yen (£185) return. Kampu Ferry Service (www.kampuferry.co.jp) from Shimonoseki (international port terminal) to Busan. These are conventional ferries with cabins, sailing overnight and departing daily at 18:00 arriving 08:30 next morning. Fares around 9,000 Yen 2nd class (with tatami mat sleeping place), 12,000 Yen (£92) 1st class (with bed in a western-style or Japanese-style cabin with shower & toilet), deluxe cabins and suites also available. It's 10% cheaper to buy a return ticket, but still reportedly cheaper to buy another one-way ticket back when you get to Korea. Camellia Line between Hakata & Busan by conventional ferry, www.koreaferry.co.kr (English button top right). Sails overnight (22:00-06:00) in one direction, by day (12:30-18:00) in the other. One-way fares from 80,000 Won, or from 1000,000 Won with cabin berth. You can book online. You may find it easier to book these ferries in plain English at the Seat61 ferry shop. First simply select Japan or South Korea as your departure country. Take a train across Japan to Hakata-Fukuoka or Shimonoseki. Hakata is the end of the high-speed shinkansen line from Tokyo, Kyoto, Osaka and Hiroshima - see www.hyperdia.com (English button upper left) for train times and fares within Japan. Take the Beetle from Hakata to Busan or the overnight ferry from Shimonoseki to Busan. To check Beetle times and fares, see www.jrbeetle.co.jp and use the Chrome browser translation feature if necessary. It may be easier to book in English at the Seat61 ferry shop. For train service between Busan and Seoul, see www.korail.go.kr. The Beetle ferry between Hakata in Japan and Pusan in South Korea. The Beetle is a fast Boeing jetfoil, which rises out of the water on hydrofoils when it gets up to speed. Courtesy of Philip Dyer-Perry. All major towns and cities in South Korea are linked by an efficient railway. For train times and fares visit www.korail.com. In addition, Seoul and Busan (the older spelling is Pusan) are linked by a new high-speed train service known as KTX. The KTX runs on a new high-speed line built using French TGV technology. Trains run frequently, taking just 2 hours 35 minutes. The fare is 45,000 won (£25) one way 2nd class, 63,000 won (£35) 1st class. 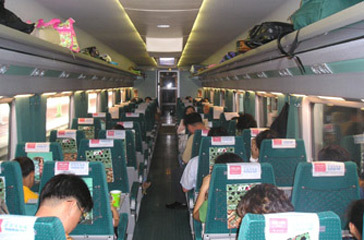 For times, fares and online booking of KTX trains, see www.korail.com. 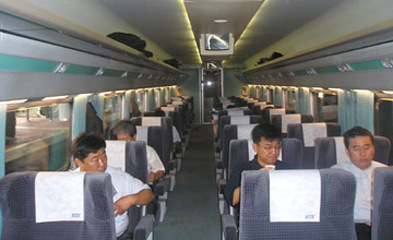 Right: The high-speed KTX train from Seoul to Busan. Photos courtesy of Shigeyuki Kaneko. For train times, fares & online tickets see www.letskorail.com. The official Korail site is www.korail.com (click 'ENGLISH' top centre for English) but to buy tickets or a Korail Pass, go to their sub-site www.letskorail.com and use the 'LANGUAGE' selector top right to switch it to English. It works best in internet explorer, you may encounter problems buying tickets in other browsers such as Firefox or Safari. The high-speed KTX trains between Seoul and Busan are highlighted in pink. But if you are not in a hurry, the much slower non-high-speed Saemaul or Mugunghwa trains are cheaper and use the old route winding around the hills rather than through them. After booking, you must exchange your internet confirmation for a ticket at the station before departure. You will need to show your passport. You can buy tickets at the station, but trains are busy on Fridays and Sunday evenings, so buying in advance is a good idea. Trains are also busy around the two main 3-day national holidays, the lunar new year and Chuseok (meaning harvest, the 15th day of the 8th lunar month) as people travel home at these times. Believe it or not, there a railpass for Korea, giving unlimited travel over the whole Korail network, including both their high-speed KTX and regular trains (but excluding tourist trains & city metro trains). For details and to buy a pass online, see www.letskorail.com, select English top right then click for the Korail Pass. A new private high-speed operator called Super Rapid Train (SRT) started operating in December 2016 in competition with the existing State-owned Korail trains between Seoul & Busan and Seoul & Mokpo. In Seoul, trains are currently using an out-of-the-centre station at Suseo, an hour by metro from central Seoul. See www.srail.co.kr for info - it's currently only in Korean. Check reviews on Tripadvisor.com's South Korea page. 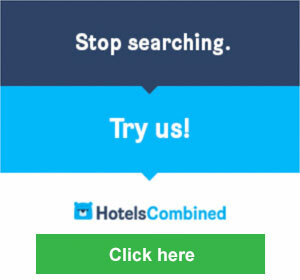 www.booking.com is my own preferred hotel booking system (Hotels Combined being a search/comparison system). It has a simple interface, a good selection in most countries worldwide, useful online customer reviews of each hotel, and decent prices, usually shown inclusive of unavoidable extras such as taxes (a pet hate of mine is systems that show one price, then charge you another!). www.hostelworld.com: If you're on a tight budget, don't forget about backpacker hostels. Hostelworld offers online booking of cheap private rooms or dorm beds in backpacker hostels in most cities at rock-bottom prices.